Dennis and Ruth Ann Shively thought about adoption for a long time. They did all the work necessary to adopt through the foster care system in their home state. Just as they were ready to go forward with that, the law changed - families with five kids were no longer eligible to adopt through foster care. Dennis thought maybe God was telling them they shouldn't adopt. Their caseworker wondered if maybe God was saying that they should adopt internationally. 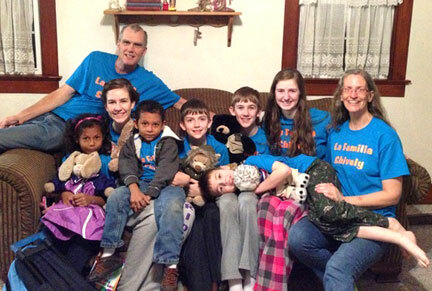 The Shivelys left for Colombia in February to bring Carmen and Victor home to their brothers and sisters. Now, "La Familia Shively" is busy introducing their new members to snow and all the other wonders of life in the USA. "It is a whale of a challenge," Ruth reports, "but we are so glad we did it!" Email Nichole Deal to learn more about adoption from Colombia.